Past methods of mark and recapture have been less than ideal for both the bear and human. 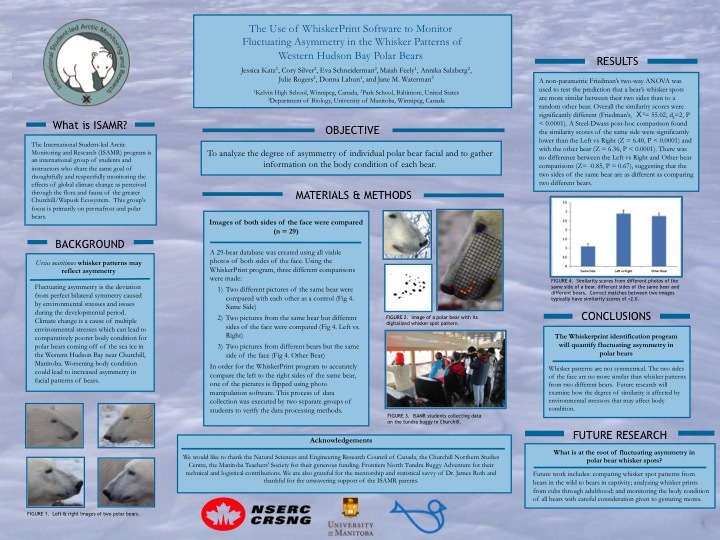 Whisker printing provides a non-invasive form of mark and recapture monitoring in which whisker printing software identifies polar bear whisker prints from photographs. Each bear has a unique whisker print, analogous to human fingerprints. In October 2013, students from ISAMR began a partnership with the software’s founder, mammalogist, Dr. Jane Waterman, to refine and test the validity of this less-invasive method. This research gives students the opportunity to partake in groundbreaking tracking and population estimation methods of polar bears in the Churchill area. See below for our whisker printing posters.